I got a call at 1:50 today from Shawn’s school nurse, he had yet another headache. The Tylenol didn’t touch it and he needed to come home. I found myself picturing Shawn at Disney a lot today. He adores the “World” and everything about it…hmm…a lot like his Mom 😉 He is always grinning from ear to ear, with his big dimple on display. I often go there in my mind…to Disney…and I gather together the memories of past trips. I went searching for this photo of Shawn and Goofy. It was during our last trip in April, and he insisted on a pic of just the 2 of them. He remembered how on the previous trip in August, Goofy had given him a high-five…and he thought that was the coolest thing. 🙂 He kept following Goofy around the room with his eyes…and I just sat there smiling and soaking it all in. Little did I know that just a few months after that, I’d give anything to see that happy smile again. Tears come easy for me these days, which is quite unlike me. It’s a culmination of months of not being able to fix this…and the utter helplessness that I feel. Mom’s are supposed to be able to fix hurts…and when I can’t it, it literally, physically hurts my heart 🙁 Here’s hoping tomorrow is a better day. 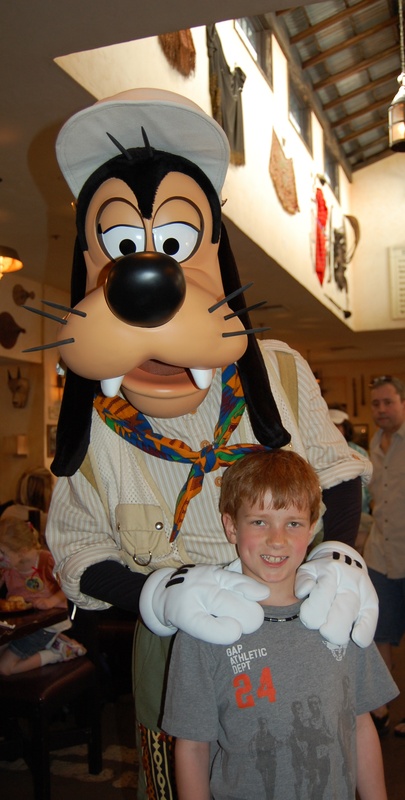 This entry was posted in Daily Memories, Disney, Family Life. Bookmark the permalink.